I had a moment a bit ago full of peace, full of joy, full of renewal. I just returned from the church, where I went for night prayer and, more importantly, simply to sit in the presence of God and kneel at his feet in Tabernacle. It was raining at the time. The church is simply beautiful! I began reflecting on the glorious Easter Vigil Saturday night and the wonderful celebration Sunday morning. After these celebrations, and indeed still, I found myself filled–like wine fills a glass. It’s always such a refreshing feeling! I found myself sitting in this beautiful place, but partly sad that the hum-drum is about to begin again. But Fr. Bill’s homily from Easter made me realize that these celebrations–which I was able to enter into in a profound way–ought to change me, ought to make me a different person in the midst of the hum-drum. As he preached, we all came to Easter with some sense of loss–lost feelings, lost friendships, lost times. We all have experienced loss in different ways as time goes by. The biggest loss, he explained, comes from losing touch with God. 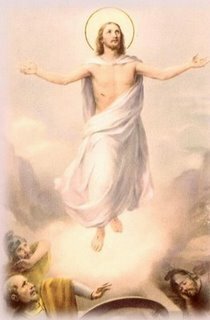 But Easter affords us a new opportunity to be changed, to be healed by the power of the resurrection. Perhaps we never can go back to how it was back when, and that’s for the best! After all, following Jesus’ resurrection, things didn’t simply go back to how they had been before. No, the apostles were at their best after this momentous occasion. And so ought we! Christ gives us new life. Death and loss are no more. Now, in this season of Easter, it’s fairly easy to celebrate life. First communions and confirmations are in the horizon, graduations near, flowers bloom. It’s a time of newness in the exterior world. So ought it be within. And yet, I wondered, how will I “be at my best” after this occasion? It’s high time I redouble my fervor by spending more time at the foot of the Tabernacle, by listening more, and by raising my confidence that our Lord is there looking at me in return. This entry was posted in Liturgy, Prayer, Reflections, Saint Quotes. Bookmark the permalink. Oh, yes! I appreciate your going over some of the remarks and thoughts given to us by Father Bill..I needed to see them again and recall what all he said..it was so glorious the entire Tridium! Happy and Holy Easter time to you also, Mike! Mike..just read your comment on my blog. I think you might also know that Amanda..the young gal I wrote about is Kyle Field's sister-in-law. Yes! It is so fun to watch the Lord change a life for the better..watching people start to draw closer to Him! Oh, what a thrill it is and oh to watch my own come closer..how I wish I could see the unfolding of that more with each one…patience, prayer, and thanksgiving..utter dependence on Him and His Mercy!